The beginning of this year I vowed I would post on my blog more regularly. Little did I know how hard it is to think of different topics to post about. I also want to keep this blog fresh and not simply be me ranting about various issues. So, after much I thought I decided to write my very first review post! For those who do not know what I look like I have blond hair. Really bright, blond hair. It has been coloured this way for years and I don’t think I would have it any other way. There are many problems which come with blond hair, dyed blond hair at least, with dryness and quick showing roots being the two most common. To try to keep my hair in the best condition, I only dye my roots. This brings with it however a new problem in that my hair can tend to go a slight orange colour in the areas which are not refreshed so often. 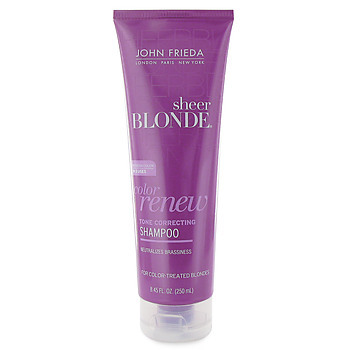 Bring in John Frieda Sheer Blond tone corrector shampoo! This shampoo is a must for anybody with coloured blond hair like my own. After approximately 4 washes you can see a big difference in the colour of your hair with any orange tones fading dramatically. The shampoo is not harsh on your hair either leaving it beautifully soft. Of course you can throw in the conditioner as well for some added zest! There you have it, short and sweet, my very first review post. Hopefully there will be more to come when I find some more products worthy of a mention.